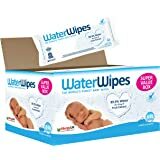 Amazon's Choice for "water wipes"
The world's purest baby wipes. 99.9% pure water and a drop of fruit extract. Suitable from birth. 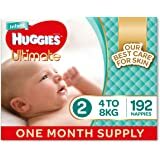 Cleaning a newborn baby's delicate sensitive skin requires the mildest, gentlest care possible, to avoid skin sensitisation problems. 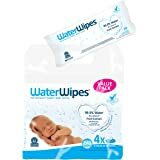 Thanks to WaterWipes, parents have the the convenience of baby wipes with the absolute purity and efficacy of cotton wool and water. Q. My midwife recommends cotton wool & water for the first few weeks. 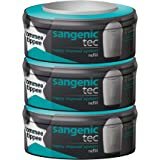 Can I use WaterWipes? A. Yes, midwife Margaret Merrigan Feenan recommends you use cotton wool & water OR WaterWipes. Q. 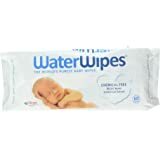 What are WaterWipes made from? 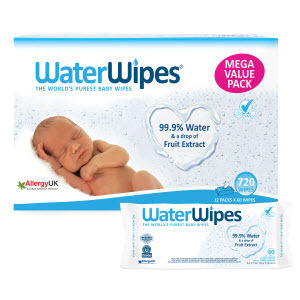 A. WaterWipes contain 99.9% water & a drop of fruit extract (contains trace of benzalkonium chloride/BAK). The levels of BAK are negligible and have no impact on the safety of WaterWipes. Q. 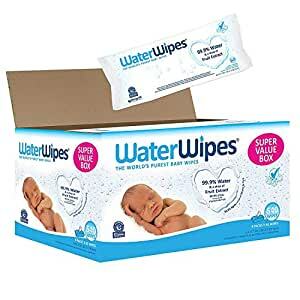 Are WaterWipes flushable? Are they biodegradable? A. No. Please do not flush WaterWipes. Currently WaterWipes are not biodegradable but we are testing different materials and have set ourselves a deadline of 2025 to find a solution. Q. 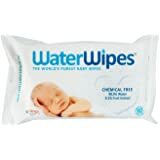 Are WaterWipes safe to use on hands and face including around the eye area? A. 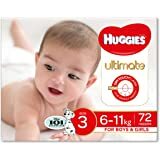 Yes, they are perfectly safe to use on your baby’s hands and face including the eye area. We love these! We have been using them since bub #1. We couldn’t solve where her rash was coming from until we changed to waterwipes and the rash was gone. 2.5 years later and bub #2 arrived and we are still only use waterwipes. 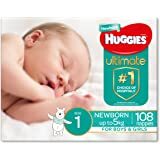 These are by far the best wipes we have used on Bub, won’t use anything else now. 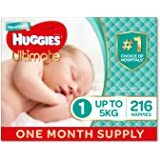 5.0 out of 5 starsBest wipes around by far! Super moist and incredibly pure. Definitely worth the extra cost.